Puppies can be tested 4 days after being weaned. WHY TEST FOR EPISODIC FALLING SYNDROME? In 2012 scientists at the Kennel Club Genetics Centre the Animal Health Trust undertook a study to measure the frequency of the mutations responsible for curly coat/dry eye syndrome and episodic falling in Cavalier King Charles Spaniels in the UK. Out of 224 dogs tested, 19.1% were found to be carriers of the EFS gene. on the Episodic Falling page. 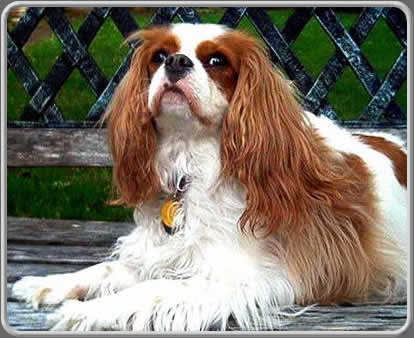 The most important reaso n to test your Cavalier if you even think that he might have EFS is that you want to have the information ready if your Cavalier takes a turn for the worse and the symptoms become more severe. You don't want to wait for the DNA test when you want to medicate immediately. We owe it to our beloved Cavalier breed to test. Cavaliers have such a small gene pool that being a ‘carrier‘ does not mean that the dog should not be bred now that we have the test. For example, if it has a good heart, your Cavalier can be responsibly bred to a ‘clear’ dog without risk of creating EFS puppies. Again, testing will let us know which puppies are carriers and must be bred with caution or neutered and put in pet homes. While generally EFS Cavaliers show symptoms between six and twelve months, there have been reported cases where the initial symptoms did not appear until years later or go unnoticed at all. Acquiring a puppy with EFS can be devastating to new owners. By the time EFS exhibits symptoms the owners have fallen in love with their Cavalier and seldom give it up. This means many years of dealing with the symptoms of EFS. 1. A Cavalier with two EFS genes will almost certainly show EFS symptoms and will be ‘affected’ although sometimes dogs have two EFS genes and no symptoms. 2. A Cavalier with one EFS gene and one normal gene will be a ‘carrier’ and will never display symptoms. A carrier Cavalier however will be able to pass on EFS. 3. A Cavalier with two normal genes and is said to be ‘clear’ and will not pass down EFS genes to it’s progeny. It does not have the gene for EFS. By definition a carrier has one EFS gene and one normal gene. A 25% chance of being affected. A 25% chance of being clear. A 50% chance of being a carrier. If we test all breeding Cavaliers we can avoid this dangerous situation. A 50% chance of being clear. No puppies will be affected. If we test all breeding Cavaliers, we can ensure that puppies from otherwise healthy carriers will not be affected. A 50% of being a carrier. Affected dogs should never be bred.